I decided to upgrade my iPad to a model with 3G wireless (so I could access maps in the car if need be), so I was once again able to avail myself of the Apple Recycling Program. This time, I shipped off a Radius color pivoting monitor and another Power computer, both probably dating from 1998. Total shipping weight: 92 pounds. Shipping weight of the iPad: 3.3 pounds (about 1/28 as much). So if you’re on the fence about getting an iPad, think about it as a great way to clean out your closet! Is the Future the Past? One thing that struck me about John Siracusa’s interesting article on Apple’s language and API future: Apple did a high-level language once before. NewtonScript. There was also a visual design tool, Newton ToolKit (NTK). The combination of a dynamic language, no pointers, and a graphical editor was quite productive. And NewtonScript was good enough to use for all of the system apps. Yes, there was a little C++ code in parts, but a lot of it was probably premature optimization (there was nothing like Shark or Instruments for Newton). I don’t know what direction Apple is moving, but at the very least it’s an interesting proof of concept for something that works well in a mobile device. Phishing Is For Phones Now? To make it even more suspicious, it was a computer-synthesized female voice, though they mentioned something about recording the call. This has never happened to me before, so I reported it to http://phonephishing.info/report/. 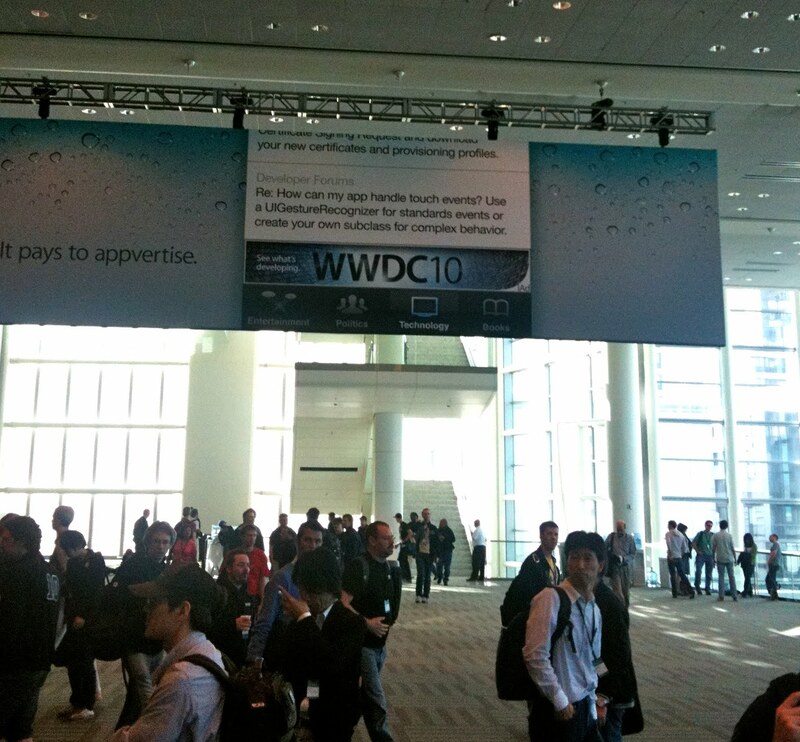 Others have reported already, and everything except the keynote is covered by nondisclosure. But here are a few random thoughts on Apple’s Worldwide Developers Conference, held last week in San Francisco. Apple made it very hard to plan — about 6 weeks notice. Luckily my employer, Rogue Amoeba, was waiting to pounce, because the event sold out in only 8 days. I’ve been to the conference a number of times (I think my first was 1989), so I knew I’d be getting a t-shirt, and packed accordingly. Except this year they no longer handed out a t-shirt and a bag (sadly I didn’t go last year, when they handed out a slim laptop backpack). This year it was a lightweight jacket. This was actually pretty useful, given the temperature, but meant I had to get my own WWDC shirt so I didn’t stink on Friday. Oddly, unwashed developer wasn’t something I noticed. I did however have to sit through a session next to someone with bad breath, someone smelling of alcohol (in a 09:00 session), and a smoker. It was pretty obvious from the event list going in that it was going to be an iPhone-centric show. Apple doesn’t release all the event names until after the keynote, so I had some hopes that there would be a little more Macintosh content. Sadly, there wasn’t. On the other hand, I did manage to get to one session (the last one as it happened) that was directly helpful to my current work on Pulsar. More surprising was the number of women. There are never a lot (you inevitably hear someone joking about the lines for the men’s toilet and the lack of line for the women’s), but this year seemed worse than I remember. Perhaps I was especially surprised because the very capable programmer I hired to do an iPhone game while at GameHouse was a woman. Overall numbers seemed bigger than I recalled from 2 years ago as well. I remember lining up for the keynote, but I didn’t remember having to line up for other sessions — and some of these lines snaked around two corners. I believe the conference cost significantly more this year ($1600), but the amenities seemed cut back. I already mentioned the reduction in attendee premium. 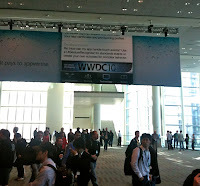 There was also no reception, and no espresso bars inside Moscone. And the Beer Bash didn’t serve sushi. We also got nothing at registration except the jacket and badge. Going paperless seemed reasonable though, because there was a custom application (apparently this was first available last year). It had some usability problems, and crashed relatively often. It was handy to have on both my iPhone and iPad despite that. Speaking of iPad, this year I decided to try leaving my laptop home and using just an iPad (with Bluetooth keyboard) to take notes. This made it the first year I didn’t have to worry about keeping my battery charged (although several of the session rooms had electrical outlets attached to the seats, a great feature I made use of 2 years ago). I plan on discussing this more in a later post. All in all, I found the week worthwhile, though I would have liked more on Macintosh.